ASUR was involved in the NASA activities in winter 1999/2000. Funded by the European Union ASUR was operated on board the NASA DC-8 research aircraft. 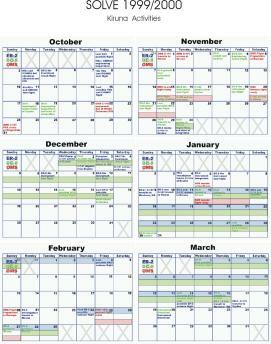 A schedule of all NASA activities during SOLVE is given in the plot below. Shown are the periods with the aircraft based in Kiruna (Sweden). In addition, the high altitude aircraft ER-2 operated in mid and late winter and four in-situ and remote sensing payloads (OMS) were launched on large balloons. 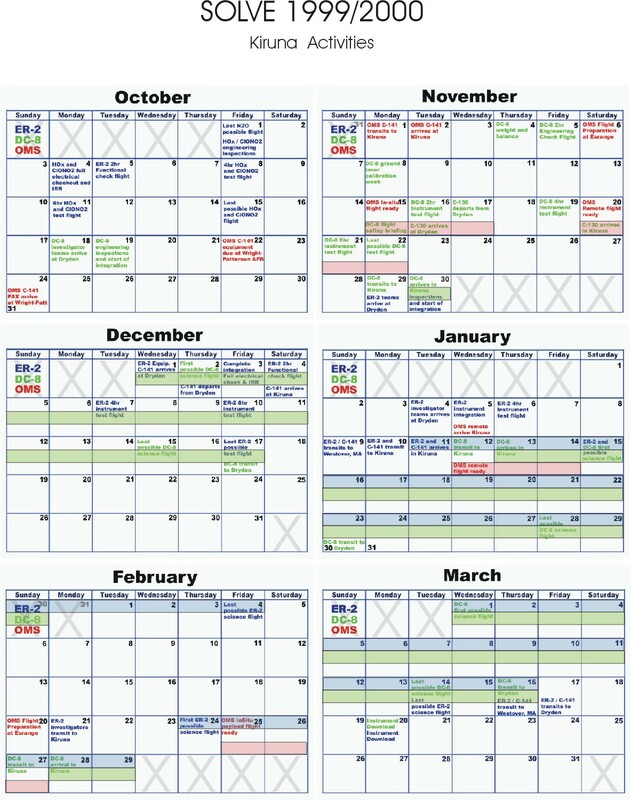 For simplification the bars indicate the first three days after flight readyness. However, due the weather conditions the flights of the OMS remote gondola were delayed to 3 December 1999 and 15 March 2000, respectively. Click here for a detailed overview over all flights with ASUR during the SOLVE campaign. This plot is based on the information given on the SOLVE homepage. The data of ASUR's operational products are open to the public. Vertical profiles of ozone, HCl, ClO, HNO3, and N2O measured by ASUR during the SOLVE campaign are available for download on NASA's SOLVE data server. Please contact the ASUR group (e-mail: asur@iup.physik.uni-bremen.de) if you want to use these data for your scientific work. Further the plots of the near-realtime analysis perfomed during the campaign have been put on the web to provide an overview over the measured quantities. The plots are given as encapsulated postscript files and show preliminary volume mixing ratios of different trace gases along the flight path. ASUR's participation in the SOLVE/THESEO 2000 campaign resulted in several publications in scientific journals. Kleinböhl, A., et al. : Vortexwide Denitrification of the Arctic Polar Stratosphere in Winter 1999/2000 determined by Remote Observations. von König, M., et al. : Using gas-phase nitric acid as an indicator of PSC composition. Bremer, H., et al. : Ozone depletion observed by ASUR during the Arctic Winter 1999/2000. Carslaw, K. S., et al. : A Vortex-Scale Simulation of the Growth and Sedimentation of Large Nitric Acid Particles Observed during SOLVE/THESEO 2000. -- J. Geophys. Res., in press, 2002. Newman, P. A., et al. : An Overview of the SOLVE-THESEO 2000 Campaign. Rex, M., et al. : Chemical depletion of Arctic ozone in winter 1999/2000. -- J. Geophys. Res., 107, D20, 10.1029/2001JD000533, 2002. Greenblatt, J. B., et al. : Tracer-based Determination of Vortex Descent in the 1999/2000 Arctic winter. Fahey, D.W., et al. : The detection of large HNO3-containing particles in the winter Arctic stratosphere. -- Science, 291, pp. 1026-1031, 2001. Results of other groups can be downloaded from the THESEO 2000 Palermo page! The SOLVE campaign is carried out in cooperation with the European Theseo 2000 program which also finances the ASUR campaign activities in 2000. Informations about the other activities supported by this program can be found on the Theseo 2000 homepage and on the homepage of the European Ozone Research Coordination Unit. Within Theseo 2000, the EuroSOLVE project has the objective to create the best possible synergy between Theseo 2000 and SOLVE. 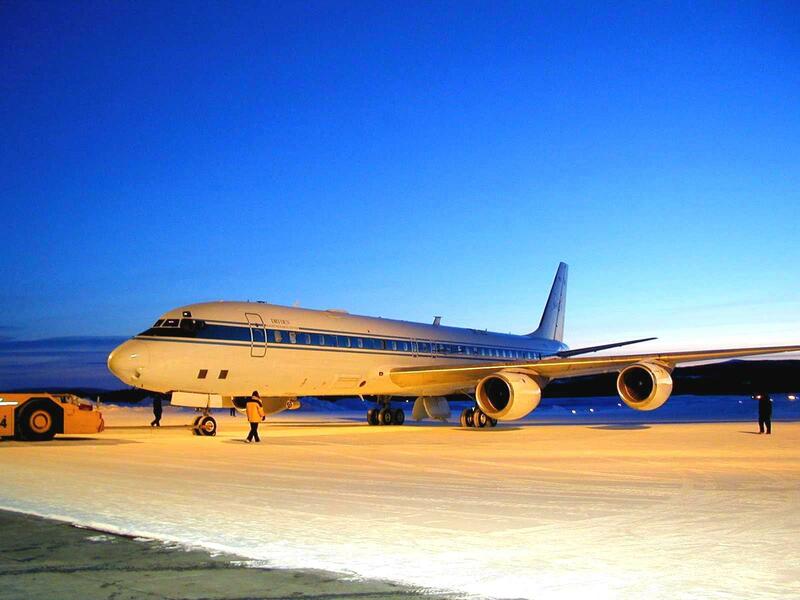 NASA's airborne laboratory DC-8 is being prepared for a research flight in Kiruna. The ASUR instrument in operation onboard the research aircraft DC-8.